It's the end of the semester, so now I have some free time and I can really get after it and read some books. I recently tried to quantify all the translated books I've read, and they pretty much fell into three categories: European, Latin American, and Murakami. * But there were no African writers and very few Asian writers (not even African writers writing in European languages). This past month I listened to Ghachar Ghochar by Vivek Shanbhag - translated from Kannada (spoken in India) - it was a very short, but very well constructed family drama, with an undercurrent of violence. 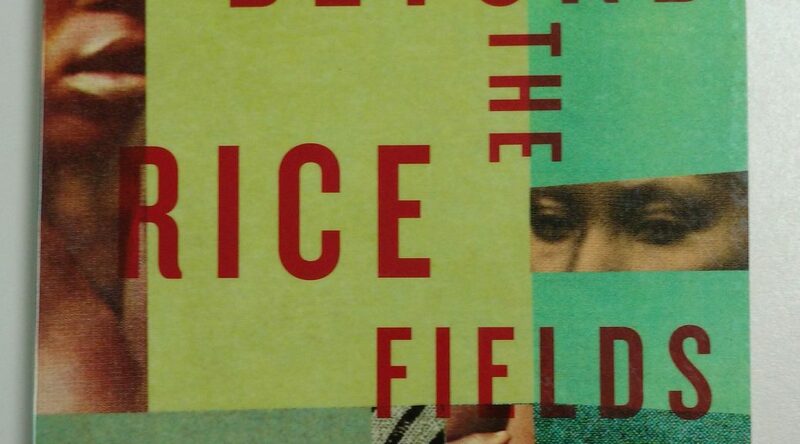 And this month I'm picking up Beyond the Rice Fields by Naivo. This is the first Malagasy novel that has ever been translated into English. Madagascar is already so strange and interesting, so I'm excited to see what the book is like. So I've been expanding my reading in that direction, what have you all been reading? * one notable exception was Han Kang's The Vegetarian (from S. Korea)- which is hallucinogenically great. Just when no one expects it ... It's First Monday Book Day! what the hell is this place coming to? I read A Monster Calls at the urging of my 15 year old. I was surprised by how great it was. I think the target is preteen/young adult but it was really well done. The artwork is really good in the hard cover. A very deep consideration of the idea of transition (the title coming from the philosophical question of whether replacing every plank and nail on the Argo one by one results in a new ship). It started off remarkable, and was an interesting read all the way through. Poetry. Nominated for the National Book Award last year. The themes are the danger inherent in being a black man, a gay man, and an HIV-positive man. I was waiting for a poem that I could point to and say "this is where I really got it", but that wasn't there. Instead this collection is a solid, cohesive unit. Unreliable narrator, but not in a tricky way. I think this was a well-written novel that found the wrong reader in me. Helen (the narrator) deals with depression, alienation, and suicide, which results in situations that toe the line between uncomfortable humor and just plain discomfort. That's unfortunately not my wheelhouse, but there is no shortage of rave reviews of this book, and I never felt like I needed to put the novel down. Book 2 in the series, this is all set up for book 3. So, I guess I'll report back once I've read the next one on whether it was worth it or not. Favorite book of the month. It's short (it took about an hour to read) and really effective. Told through a mother who hallucinates (maybe?) a conversation with a child (not hers) that she met once (maybe?) who suffered the same thing that is currently affecting the mother who is lying in a hospital bed. It's circuitous and feverish and fraught. I kind of really liked it. Just a touch of magical realism adding to a story of shame and mistrust and secrets. The center of the novel is Clarisse, who has changed her name and disowned her mother and then named her daughter after that same mother who doesn't know that her granddaughter exists. That reflection of names through a shame that can't be acknowledged is maybe the best indicator of how this novel works. Another good one. Read Borne first, and then read this. It made me rage against the inhumanity of the same characters that I had been sympathizing with in Borne. Heartbreaking horror. I hate that kind of writing. I get the trilogy/series thing, but each volume in a book series should have significant payoff as a standalone in a given universe. Aliette de Bodard's 'Dominion of the Fallen' series has been excellent in that respect. I finished House of Binding Thorns right at the end of March and it was better than book 1 and stood alone wonderfully. I sort of thought this was amazing. However, my opinion is colored by watching many videos of him reading/performing his poetry. Goodness gracious he's great. That I can absolutely see. He actually argues that poetry should be seen live pretty consistently on his twitter feed, so I should check that out. This one is on my mental list of books I really should request from the library already. OK, now I actually did all the numbers on my translated books read, so I thought I would share (I may have overstated the Murakami category, I should rename it the Murakami/Cixin Liu category). I'm 75% through Grant. It's good, but the story of his presidency isn't flowing as well because Chernow sneaks in a snippet in every paragraph showing Grant fighting hard on behalf of African Americans. It's great that he's trying to redeem Grant's underappreciated presidency, but it's just a little over the top. Especially when he has mentioned the Credit Mobilier scandal exactly once through 750 pages and has briefly glossed over a bunch of other examples of Gilded Age excess by his underlings that he ignored. I am always equal parts jealous of the breath of your presidential history reading, and convinced that I could never accomplish the same. On the way into the baseball game I heard an interview with the author of The Power Broker. Sounded interesting but on closer glance it looks... unwieldy. Worth it? It's a great, great, great book. Robert Caro is a phenomenal writer who can make nonfiction read like Shakespeare. i still don't know because 1,300 pages. So Caro is completely obsessed with people who were obsessed with power. He wants to know how they amassed it. How they used it. How they cajoled with it. How they hid it. All that good stuff. Well Robert Moses was basically the most powerful man in NYC for 40 years without ever being elected to anything. Caro basically spends the entire book trying to explain how that could happen. I think the early chapters can probably be skipped (unless you really want to know all about how a man born into a wealthy family became obsessed with still having more, more, more), but it truly is one of the best biographies ever written. If you want to try Caro in a smaller dose, try his fourth volume of The Years of Lyndon Johnson. If you like it, then tackle The Power Broker. I agree with Pirate completely. It is a fascinating book. Long, but fascinating. If you have any passing knowledge of the way that that NYC is built up today, Robert Moses had a hand in it. It's on my re-read list and someday I'll get to it again. Also apparently there was a dropped chapter on the Brooklyn Dodgers leaving and all the machinations involved with that. God I would love Caro to pull out his old files and write that book. And I have the same feelings about all your fiction reading. I would love to read more, but it's just so difficult to get started (although I enjoyed good through a bunch of Man Booker finalists recently as a good start). Finished up Trumpet of the Swan with the kids, and we're currently working on A Wrinkle In Time, which is better than I remembered it being. It's serious, without being too dark for the kids. They seem to appreciate the real drama. We considered A Wrinkle in Time, but decided to hold off on that for now, I thought I remembered some of the later scenes as being really intense. On the kids reading front, we're reading The Invention of Hugo Cabret right now. Lots of drawings make the 600+ pages fly by. I think the little one is enjoying it. Before that we read The Adventures of Alfie Onion which was good fun with a really big cast of characters. Oh yeah, the kids who are in school appreciate the seriousness, but the younger one(s) do not. If you like Brian Selznick, you might want to check out Baby Monkey, Private Eye. I've heard fantastic things about it and am currently waiting for it to come in at the library. He got Baby Monkey, Private Eye for his birthday from his grandparents, and would stay up after we tucked him in reading the next chapter and shouting updates to us for each case. It's pretty cute, and there are some hidden clues to discover in each chapter. The jalapeño has been into sports-themed books lately. He has read a couple books in the Ballpark Mysteries series by David A. Kelly--they're cute stories and just over 100 pages, so they're quick reads as well. Last week he tore through The Crossover by Kwame Alexander, which is a novel in verse that won the Newbery a few years ago. A prequel, Rebound, just came out last month, and I've already promised I'd get him that one. He brought home one of Kate Messner's Ranger in Time books from the spring book fair. I have seen that series but never actually read one of the books, so I should probably read that when he's done with it. When I was growing up, my mom read a lot of the books that I read (once I got to an age when she wasn't reading aloud to me as often), and I loved that we were then able to talk about the books together. I asked my parents to bring over my childhood copy of A Wrinkle in Time, but he didn't want to start it. Thinking on it, I was probably in 4th grade the first time I read it, so I figure he can get to it when he's ready.